Function : Stud for 200 horses is intended for breeding and training of workers and sport horses. The percentage is determined by refining the specialization of the enterprise. Sketch of the project demonstrates a fundamental functional zoning, and workflow. The system of horses, the range of types and sizes of individual buildings and structures will be adopted taking into account specialty farming, adequate availability of land, climatic conditions, construction zone and to ensure maximum efficiency of buildings. 1. Indoor arena for training horses - 1600 sq.m. 6. 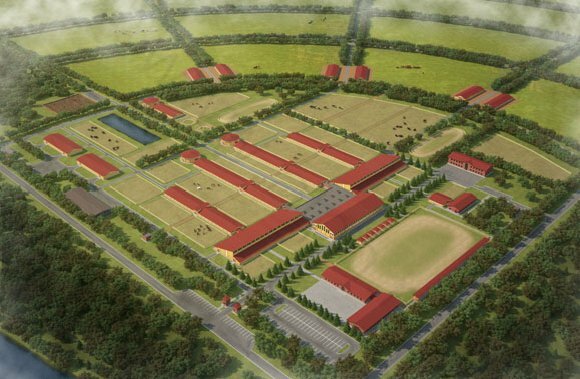 Arena for the mating of mares, showers, a solarium, a blacksmith shop, harness shop, locker room personnel, the technical area - 2000 sq.m. 7. Stable stallions with individual stall, a solarium and shower heads by 10 - 600 sq.m. 8. Drum for stallions - 250 sq.m. 9. Hay storage - 1000 sq.m. 10. Storage of feed and bedding - 1000 sq.m. 11. Autoscales - 100 sq.m. 12. Sheds for storage and maintenance of vehicles and agricultural equipment - 1,000 sq.m. 14. Checkpoint - 20 sq.m. 15. Point guard - 20 sq.m. 16. Administration of the stud farm - 600 sq.m. 17. Dining room staff - 600 sq.m. 18. Veterinary unit with the quarantine stables, laboratory, fodder, etc. - 630 sq.m. 19. The residential block with accommodation and living-room lounges - 1200 sq.m. 21. Outdoor Arena - 8400 sq.m. 22. Fire pond suitable for swimming and summer training horses - 2500 sq.m. 23. Storage tank - 2500 sq.m. 24. Parking of staff - 2250 sq.m. 26. "Elektrovodilka" for horses - 250 sq.m. 27. Open year-old barrel - 250 sq.m. 29. Paddock of the "vetblok" - 600 sq.m. 31. Paddock with unpaved - 21000 sq.m. 32. Paddock with grass - 26 000 sq.m.